Russian President Vladimir Putin said that relations between Russia and India are developing in all directions. 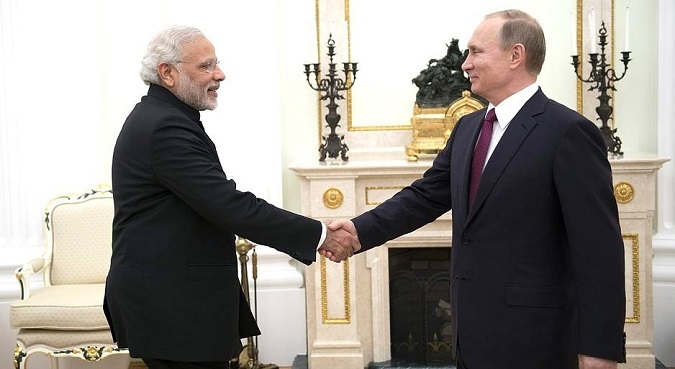 Russia and India continue actively promoting strategic partnership and coordinating political and economic activities, Russian President Vladimir Putin said Thursday during talks with Indian Prime Minister Narendra Modi. "We are consistently and confidently developing privileged strategic partnership between India and Russia," Putin said. "These relations are developing in all directions. This applies to issues of policy, coordinating our efforts in the international arena, the economy, and cooperation in humanitarian fields." Putin highlighted the countries’ active interparliamentary and intergovernmental commission work, and emphasized the importance of addressing issues that require special attention in light of a complicated economic climate. "It should be noted that your visit is very timely, though planned, but timely in light of the need to ‘compare notes’ on the main directions of our cooperation," he address Modi. Modi arrived in Moscow for a two-day visit on Wednesday to hold talks with Putin on a range of bilateral issues, including transport, trade, energy, and the economy. The meeting is expected to result in the signing of a number of documents aimed at increasing trade and economic cooperation between the sides. Russia and India enjoy good relations dating back to the 1960s. Moscow is among New Delhi’s foremost post-Cold War era military suppliers. The sides have boosted trade, military-technical and nuclear cooperation over the past year.